Insect - Visual Dictionary - Copyright © 2005-2016 - All rights reserved. [img]https://infovisual.info//storage/app/media/02/img_en/038 Morphology of a flying insect.jpg[/img] [url=https://infovisual.info/en][/url] - [url=http://www.infovisual.info/]Visual Dictionary[/url] - Copyright © 2005-2016 - All rights reserved. 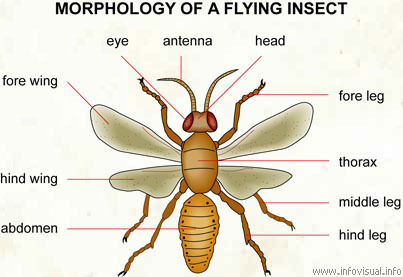 Morphology of a flying insect: vertebrate animal with segmented bodies, usually winged, that undergo metamorphosis. Compound eye: one of two complex organs of sigh. Antenna: one of two organs of touch of an insect. Head: foremost part of an insect. Fore leg: one of two front limb. Thorax: central part of an insect. Middle leg: one of two middle limbs of an insect. Hind leg: one of two rear limbs. Abdomen: rear part of an insect. Hind wing: one of two rear appendages used for flying. Fore wing: one of two front appendages used for flying.